NVidia GTX 10-series VR-Ready notebooks now in stock at B&H! A couple of days ago, NVidia announced that they were making VR-ready desktop GPUs available for notebooks. 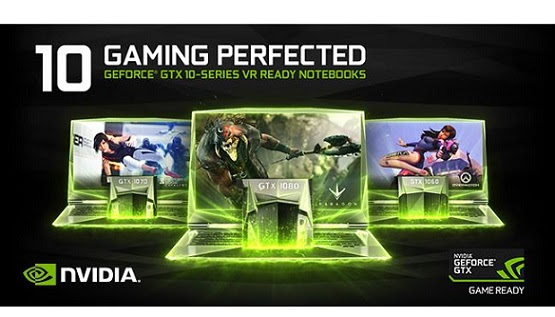 Specifically, NVidia would put the VR-Ready GTX 1060, GTX 1070, and GTX 1080 in notebooks. These aren’t watered-down M versions, but nearly identical to their desktop counterparts. This achievement was made possible by the efficient Pascal architecture. See the official announcement here. I wondered how long it would take for the actual products to show up. To my surprise, they’re actually now available and in stock at B&H, starting at $1499. – Oculus Rift requires three USB 3.0 and one USB 2.0 port. When the Oculus Touch comes out, it will add a second sensor, which I believe will require another USB 3.0 port. One of the USB 3.0 ports will be for the upcoming Oculus Touch, the others are for the sensor and the headset. The USB 2.0 port is for the Xbox controller. – HTC Vive (reviewed here) requires one USB 2.0 port, plus one HDMI port or Displayport (or mini Displayport). Although USB 3.0 is supposed to be backward compatible with USB 2.0, some users have experienced issues connecting the Vive link box to USB 3.0 (e.g. judder, etc. ).